A fantastic, heavy, reclaimed cast iron planter. The planter was originally used as a water tank and has a character tap at the base of one side. The planter has two deep compartments, perfect for planting small decorative trees or larger plants. 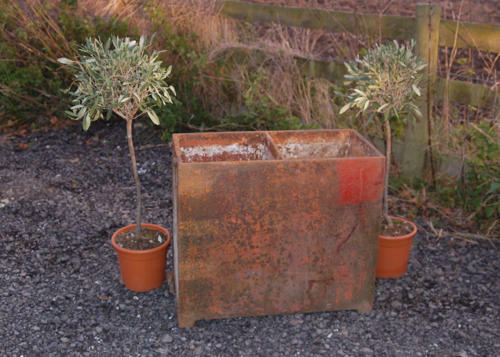 The planter has a fantastic rustic / industrial style and would be a great feature in a garden. The item is reclaimed and therefore has some signs of wear, adding to the industrial feel. The planter has surface rust, water marks, erosion and areas of red paint. There are some knocks, scratches and chips. The planter is very heavy and purchaser would need to ensure they have a suitable vehicle for collection. A very interesting, stylish and and unusual planter that has great depth for planting decorative trees. The items wear and erosion give a wonderful character and industrial design, and would provide interest to a home or business.